" When you break the big laws, you do not get freedom; you do not even get anarchy. You get the small laws. " On November 9th, 2016, (two days before Veterans Day), Stanley Grip gave the following presentation based on an article he had written for the New Oxford Review. At our January 14, 2015 meeting, our special guest was Dr. Steven O'Brien. Below is a video of that meeting, and below that is a PDF copy of his impressions of the evening which he posted on his blog. Above is a lecture given by Emma Moser at the July 8th, 2015 "Lady's Night" meeting of the Springfield Chesterton Society. Above is Part 1 (of 3) of a music lecture given by Stephen Moser at the August 14th, 2013 meeting of the Springfield Chesterton Society. (Yes, this is longer than most of our presentations). Above is Part 2 (of 3) of a music lecture given by Stephen Moser at the August 14th, 2013 meeting of the Springfield Chesterton Society. (That's right, there's even one more part after this). 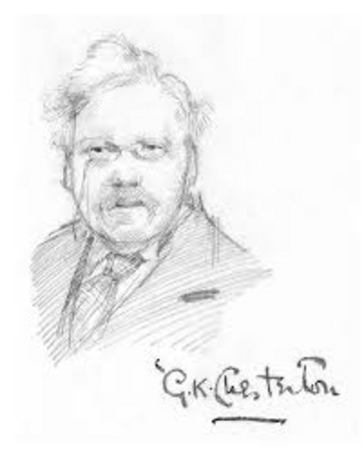 Above is the 3rd and final part of a music lecture given by Stephen Moser at the August 14th, 2013 meeting of the Springfield Chesterton Society. (It will probably be a long time before he tries anything like this again). Above is a lecture on Modern Art given by Stephen Moser at the May 9, 2012 meeting of the Springfield Chesterton Society.